The coffee manufacturing process starts with the selection of good quality, high-grown Arabica beans. This is one of the most important steps in the process - you simply cannot “roast” a poor bean and make it a good one! We have partnered with one of the worlds largest importers and exporters of green coffee beans. After farming, washing, drying and packaging, these are shipped in bags directly to our East London coffee roasting operation. 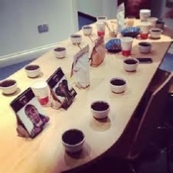 After cupping the samples supplied in our own laboratory, we analyse these against the tasting notes supplied before making any buying decisions. We select the most suitable beans which are then roasted in a manner that develops the best bean characteristics using our state-of-the-art Genio 6 and Genio 15 roasters. These are the most technologically advanced roasters in the world and they enable us to develop the raw bean into the most flavourful roasted product. Through continual cupping (tasting) and many hours spent enthusiastically testing different combinations, we identify the strengths and characteristics of each bean type before blending a selection of these together to create our Signature and Roasters Reserve Blends. In doing so, our sole objective is to produce a well balance product which meets and exceeds the expectation of the most demanding coffee lover. Our Genio roaster ticked all the boxes for us. We nick-name her Bertha IV and adopted her as one of our team - our relationship grows and grows as we produce ton after ton of the freshest coffee available. The Cutman & Hawk Signature Blend is our best selling range of coffee. Used with enthusiasm in corporate environments; at home and in the retail and hospitality industry. This range is targeted specifically at those who enjoy their coffee and have grown to expect something better than the typical commercial coffees on the market. Whether this is at home or while enjoying time at your favourite coffee shop, Cutman & Hawk Signature Blends are sure to meet the standards required by discerning coffee drinkers. We roast our coffees to levels described as a medium (or City, Filter) roast and medium dark (or Full City, Espresso) roast. We blend four different beans in slightly different combinations for each roast type in order to offer clients a balanced blend which will meet the most demanding characteristics. 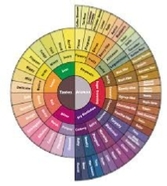 We produce three different ranges of coffee. The love of coffee in South Africa is literally growing by the day. At Cutman & Hawk, we are excited to be part of this! 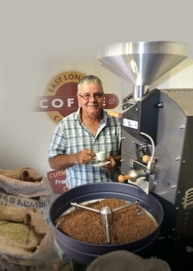 The first Roasters Reserve was literally that, a blend that our roaster, Alan, took home with him! We use our Signature Blends as a base but exclude the bean adjudged the lowest score of the four and to this we add two additional superior quality beans, defined by us as two beans which must, when assessed in our laboratory, achieve a score of over 80% and thereby qualifying to be called a speciality coffee. This is therefore our premium range. Who should buy it? This range is slightly more expensive BUT, considering that one uses an average of only 10 g per cup, the difference on a cost per cup basis is therefore only around 25c! Without sounding blasé, what is 25c nowadays? If you serve coffee commercially and need to leap a few notches above the level of your opposition, this is for you. More and more of your customers are learning more about and appreciating good coffee, they will surely appreciate this coffee! This is our speciality and single origin range targeted at individuals who enjoy experimenting with the different regional and even more specific, farm or microlot flavours. Right now for example we have a simply awesome Harrar Longbean (natural) a Burundi microlot that achieved over 90% when cupped, along with many more exceptional beans. These are usually rare and exceptionally good coffees which come across our path from time to time. Coffees which one would prefer to taste in it’s original form than as part of a blend. This warrants some explanation, so what’s wrong with the other two ranges? Absolutely nothing! There is a time and place for all three! If one was to draw an analogy with motor cars and compare our coffee with the Toyota range of motor vehicles, our Signature Blend would be the Hilux pick-up, undoubtedly a leader in it’s class and one of the best bakkie’s around, capable and reliable. More affordable perhaps than it’s Landcruiser cousin but nevertheless a sought after vehicle of distinction. The Roasters Reserve, well….a Toyota Landcruiser, one of the best off road vehicles on our roads. At Cutman & Hawk coffee we: 1. Don’t buy or roast ANY sub-optimal coffees and 2. Do not over-roast any coffee.